My cousin, Joan Heather, cares deeply about animals and the world we share with them. 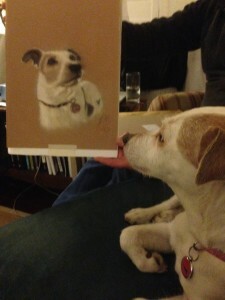 Her compassion shines brightly in her companion animal portraiture. Joan’s portrait of our rescued Parson Jack Russell Terrier captures beautifully Shelly’s strong sense of herself, including her dignity and seriousness. If you are interested in being put in touch with Joan because you would like her to draw a portrait of the special companion animal (or animals) in your life, please email me at kim@kimstallwood.com.